The Department of Applied Physics (AP) and Interdisciplinary Division of Biomedical Engineering (BME) of The Hong Kong Polytechnic University (PolyU) have jointly developed a novel nano biosensor for rapid detection of flu and other viruses. 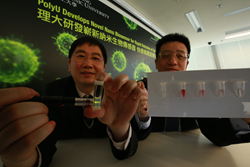 The PolyU research team has developed a novel nano biosensor for rapid detection of flu and other viruses. The technology can be widely used for the detection of different types of viruses, shedding new light on the development of low-cost, rapid and ultrasensitive detection of different viruses. PolyU’s new invention utilizes an optical method called upconversion luminescence resonance energy transfer (LRET) process for ultrasensitive virus detection. It involves simple operational procedures, significantly reducing its testing duration from around 1-3 days to 2-3 hours, making it more than 10 times quicker than traditional clinical methods. Its cost is around HK$20 per sample, which is 80% lower than traditional testing methods. The technology can be widely used for the detection of different types of viruses, shedding new light on the development of low-cost, rapid and ultrasensitive detection of different viruses. Traditional biological methods for flu virus detection include genetic analysis -- reverse transcription-polymerase chain reaction (RT-PCR) and enzyme-linked immunosorbent assay (ELISA) used in immunology. However, RT-PCR is expensive and time-consuming while the sensitivity for ELISA is relatively low. Such limitations make them difficult for clinical use as a front-line and on-site diagnostic tool for virus detection, paving the way for PolyU’s development of the new upconversion nanoparticle biosensor which utilizes luminescent technique in virus detection. PolyU’s researchers have developed a biosensor based on luminescent technique which operates like two matching pieces of magnet with attraction force. It involves the development of upconversion nanoparticles (UCNPs) conjugated with a probe oligo whose DNA base pairs are complementary with that of the gold nanoparticles (AuNPs) flu virus oligo. Given the complementary nature of the DNA base pairs of the UCNPs probe oligo and AuNPs flu virus oligo, they work like two matching pieces of magnet, which would be drawn together due to attraction force. This process is also called oligo hybridization. Upon being illuminated by a portable near-infrared laser pen, the UCNPs emit eye-visible green light while the AuNPs would absorb the green light. One can easily quantify the concentration of the targeted flu virus by measuring the decrease in the green light intensity. Not only is the design and operation of PolyU’s invention simple, it does not require expensive instruments and sophisticated operational skills, with its sensitivity comparable to traditional clinical methods. In comparison to conventional downconversion luminescent technique, it causes low damage to genetic materials and does not induce background fluorescence. In addition, since each virus has a unique genetic sequence, researchers would be able to design a complementary probe once the genetic sequence of the targeted virus is known. In other words, the upconversion LRET technology can be widely used for the detection of different types of viruses simply by modifying the UCNPs capture probe.